Whenever you see the numbers 4 or 40 in scripture, I suspect that you will find some lesson about the Messiah nearby. The fourth day of creation brought lights to rule the heavens. Esau, a type of antichrist, married two Hittite women when he was forty years old, a pre-figuring counterfeit of Jacob. Jacob was mourned for forty days. Israel ate manna, bread from Heaven, in the wilderness for forty years. There are probably dozens of other examples, but Noah and the flood is one of the best known. The rains fell for forty days and nights. One clear connection between the Flood and the Messiah is in the salvation of Noah and his family, as well as the means of that salvation. There are three words in Genesis 6:14 that are directly connected with the atonement of Yeshua. Since vowel points weren’t added to Hebrew for two thousand years after the Torah was first written down, the only difference between these words in print is the gimel (hard g sound) in gopher versus the kof (k sound) in the other two words. Otherwise all three words are spelled the same. The puns are clearly intentional. What makes this even more interesting to me is that kafar (cover) and kofer (pitch) are also identical in spelling to the Hebrew for atonement: kippur. (The F and P sounds are represented by the same Hebrew letter, peh.) Kippur is the root of kapporet, which is Hebrew for mercy seat*. See Exodus 25:17 and 30:10 among many other verses. These particular words (gofer, kafar, kofer) were used in Genesis 6:14 as a deliberate allusion to atonement. Make yourself an ark of atonement wood. Make rooms in the ark, and atone it inside and out with atonement. Noah’s ark was covered with pitch to shelter the survivors from God’s wrath, while Moses’ ark was covered with the mercy seat to be a buffer between us and God’s overwhelming presence. 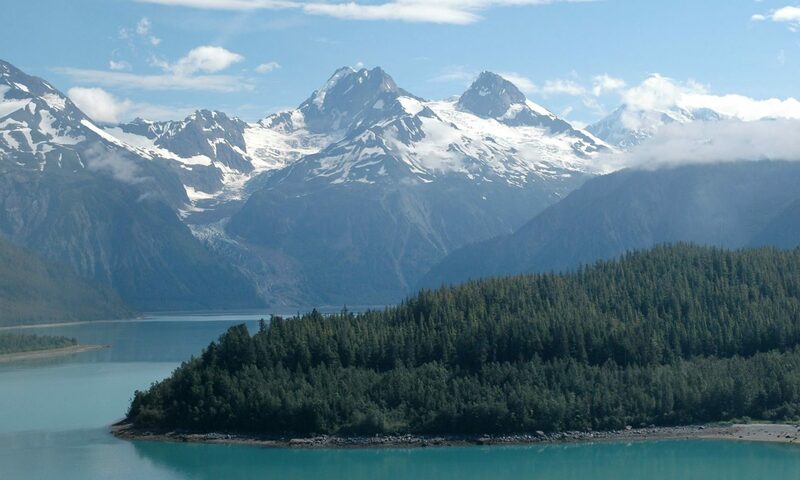 The first ark contained God’s chosen people and miraculously provided sustenance. The Ark of the Covenant contained emblems of God’s Law (the stone tablets), guidance (Aaron’s staff), and sustenance (manna), all given to God’s people and carried by them through the Wilderness. Noah’s Ark protected its inhabitants through forty days and nights of rain that eventually covered the whole earth, crushing and drowning millions, possibly billions of people. How can such unimaginable destruction contain a teaching on the Messiah? One of the most profound truths of the Messiah is that he not only saves us from death, but he saves us by and through death. We cannot approach God directly in our sinful, corrupted state. We need atonement to cover up our stench. The blood of bulls, goats, lambs, and doves was offered on the altar and on the mercy seat as a temporary atonement, but Yeshua’s blood atones for our sins more completely than that of any animal. His blood makes a permanent atonement that cleanses not only our flesh, but our spirits from all taint of sin. Through Yeshua’s death, we have been enabled to live eternally, but we must pass through death ourselves to obtain it, just like Noah and his family had to pass through the rains in order to be saved from the destruction that took the rest of the world. 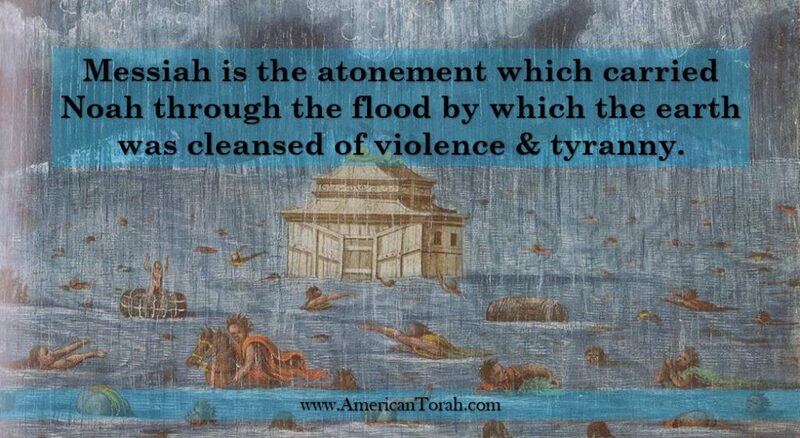 Messiah is the atonement which carried Noah through the flood by which the earth was cleansed of violence and tyranny. Ultimately, he is the atonement which carries us through Death itself so that we may be resurrected to stand before the Judgment Seat of God. He will cover us and carry us through that as well. Yeshua doesn’t always save us from trials, but he does save us through them. Our faith and mettle is tried continually by flood and fire and death, and his atonement will never fail us. We will come through the other side one day with a trove of refined spiritual gold, silver, and jewels in exchange for our own faithfulness. * “Mercy seat” is a terrible translation of kapporet. Although the cover of the Ark of the Covenant could be considered the seat or center of God’s mercy, “covering” would be a much better translation.